Sometimes when I drop my boy at Karate I peruse the local thrift shop. Always looking for a good craft bargain. So I made a card (below) and also made another one for challenges. I randomly stamped the large background in the center in Brilliance Pearlescent Poppy. 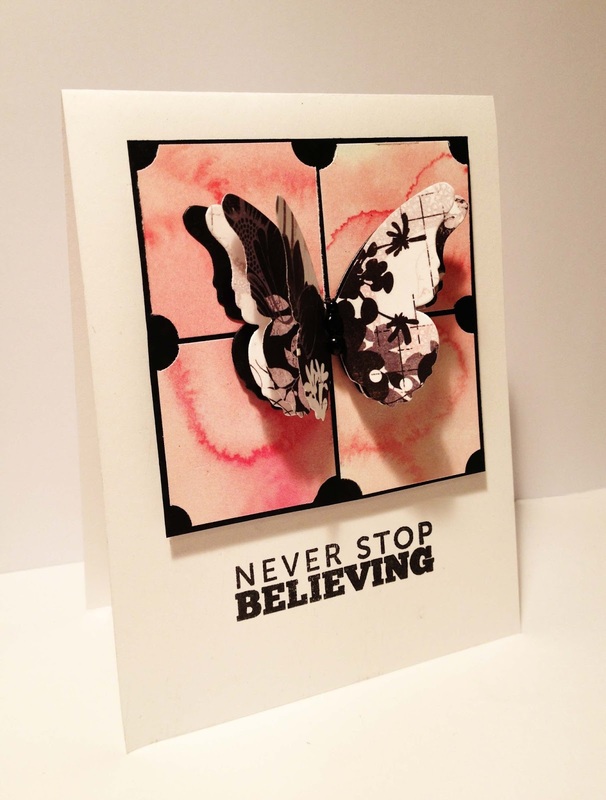 I Die cut butterflies in Black and then popped up the lovely bold paper butterflies on top. Added a few black enamel dots. Posting to: FUSION! I selected Jackie's Challenge this time! 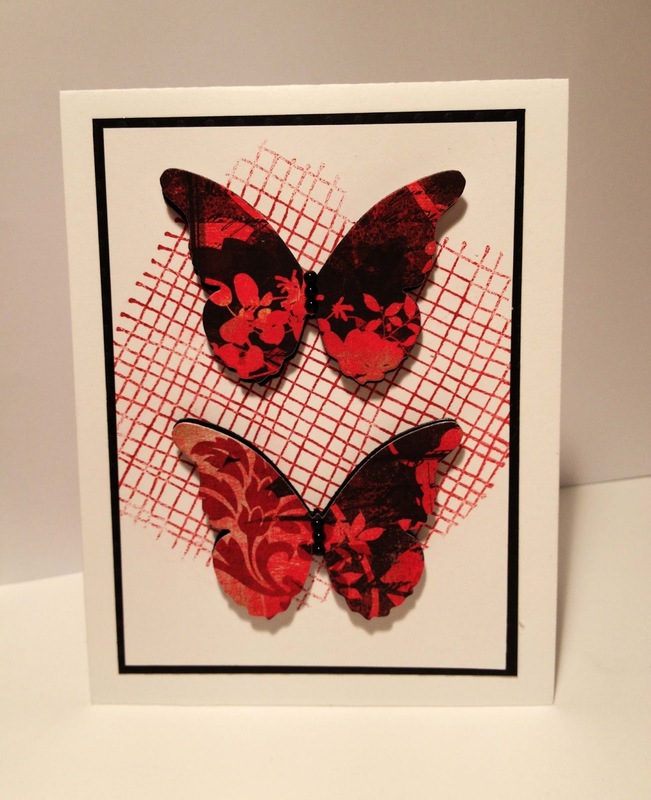 Wow!I love this Kimberly-gorgeous butterflies,that paper is just so pretty-and what a fabby crafty find ! 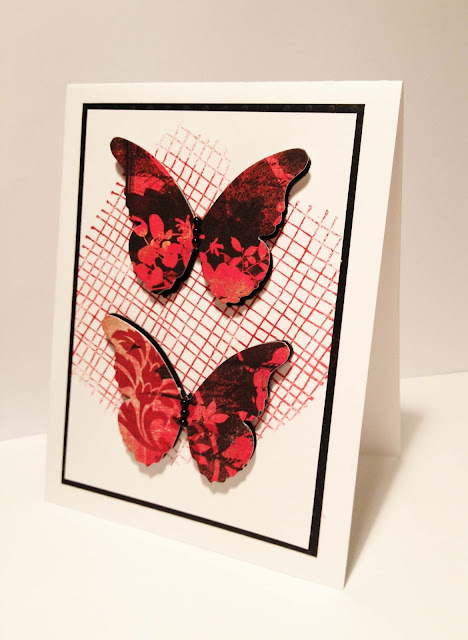 Beautiful butterfly cards. Especially love the first one with the layers. Neat background too! I really like these. You are a talented woman! 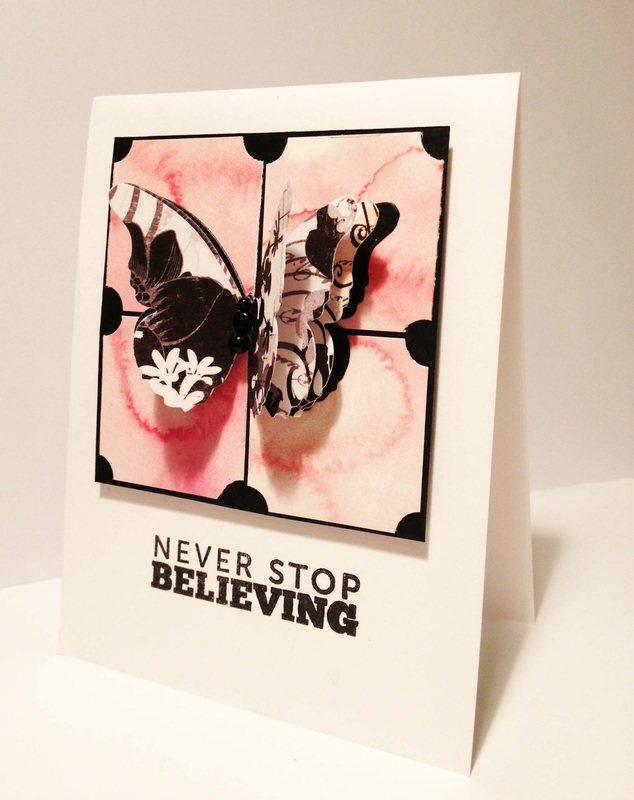 Gorgeous, gorgeous cards Kimberly -the butterflies look fantastic in the Basic Grey papers! So glad you joined in the fun experimenting at the FUSION Card Challenge - hope to see you again soon! Oh...hadn't seen this one... this one might be my fave! Love the butterflies...awesome buy at the thrift store! Thanks for playing with us at Fusion! Oh, so gorgeous!! I love your backgrounds and the papers on your butterflies. Yippee for a great find! All of your cards are so pretty...love the butterflies. Thanks for joining us this week at Fusion. Gorgeous card! Thank you for playing along with my Flutter By Wednesday Challenge! Oh my, such gorgeous butterflies. Your card is so elegant. Absolutely stunning. I saw your card at Fusion and just had to comment! We love your work, Kimberly! Congratulations on another HM win from your Fusion peers!! Gorgeous, I love that swirly background you created against the graphic butterfly! So glad you could join us for this week's Play Date Cafe Challenge! Twinkle - Twinkle : Festive Friday! Card for Kyleigh : CAS(E) this Sketch! Home is Where I am With You: CAS(E) This Sketch! Be Awesome Today: CAS(E) this Sketch! 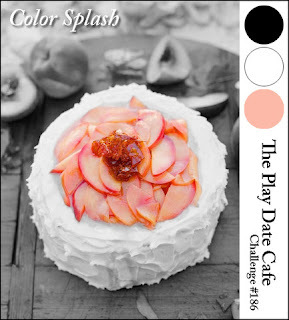 Start where you are: The Play Date Café! You're in my Prayers: Color Q! 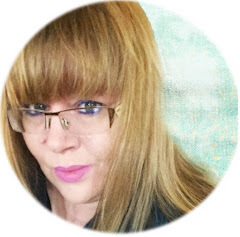 Fabulous Oh Yes You Are: CASE Study! Good Morning: CAS (E) this Sketch! I [Heart] You! 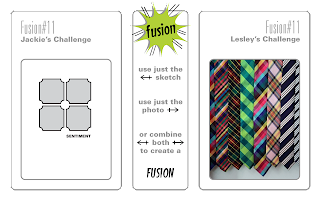 Fusion Challenge! It's a Good Day to be Happy: CAS-ual Fridays! Home Sweet Home: Case Study! Merry and Bright Festive Fridays! Wishing you Holiday Cheer: Festive Fridays! Sending Smiles: A Card for Maddy! Wow! Movin' on up to Middle School Now! Summery Thanks Bouquet: Lawn Fawn! Thank you : Green with Black for Dynamic Duos! Travel Memories - Are we there yet?? Thinking of You: Case Study! Pretty Please Pinspired Pretty Petals in Purples! You're my favorite: The Play Date Cafe! I heart this: The Play Date Cafe! Merci Beaucoup: Play Date Café! Smile it looks good on you: CASology! Play Date Café meets CASE this Sketch! Wish you were here: CASE Study! Best Wishes: Fresh Squeezed Stamps! 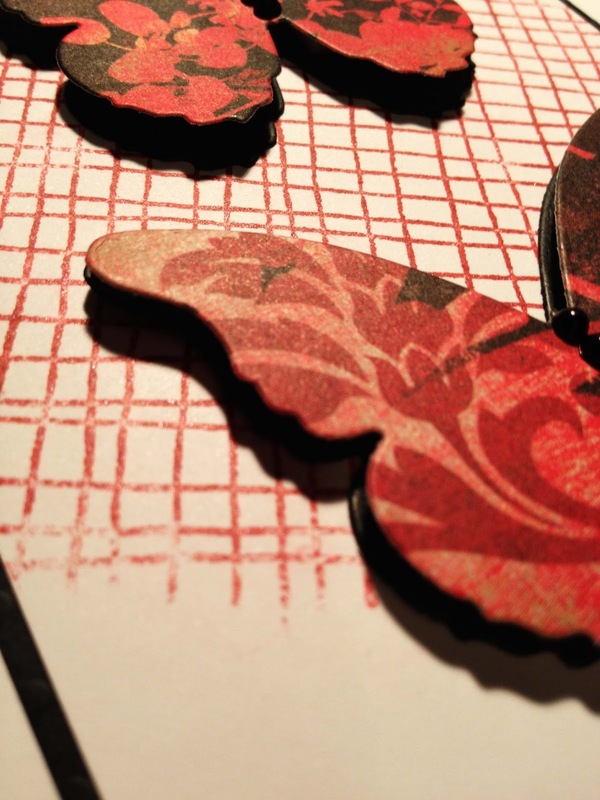 You are my Sunshine: Fresh Squeezed Stamps! Have a great Day: FUSION! Sweet Summer time. My Snorkel boy! 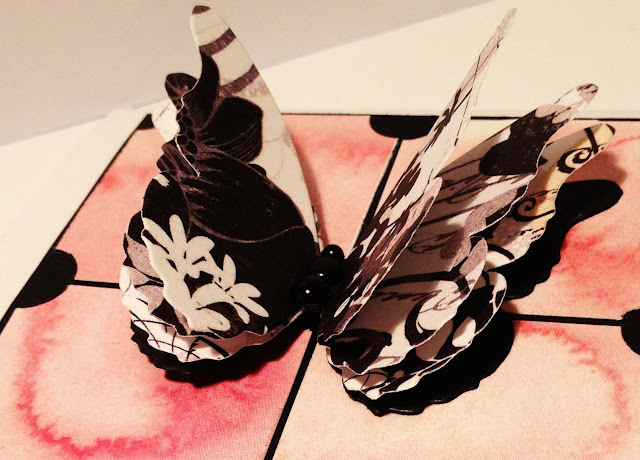 Fantasy "Golden" Butterflies: Paper Smooches! Summer Fun: The Paper Players! Welcome Sunshine: Addicted to CAS! The World Would be boring....Playdate Cafe!